Description : I like how Harry's expression turned out in this one. He's so defiant. 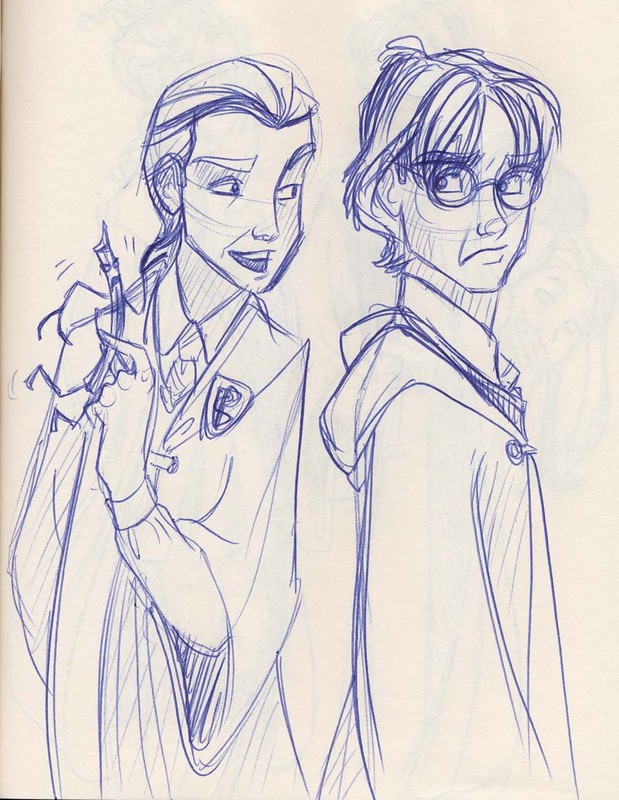 I know it's not cannon but could you draw a pic of Harry shoving that bowtruckle up Malfoy's nose?! FYI, I used to see Harry in my head as Dan Radcliff which realy irritated me (his hair just doesn't fit! ), thanks to you (this drawing in particular), I'm happy with the Harry in my head. I'd be satisfied with the bowtruckle just pinching Malfoy's ear in half. Hee. ::mumbles:: Oh, to heck with it, Harry! Just punch him and be done with it! Anyway, Draco's hair reminds me so much of Gaston...that, and the expression on his face. Love it. ->NOW THAT I WOULD LOVE TO SEE! i love the story as much as the next one, but if they had your pictures in the books even more people would be reading it. you pictures show ezactly what happened. I like the furious look on Harry's face!!! !